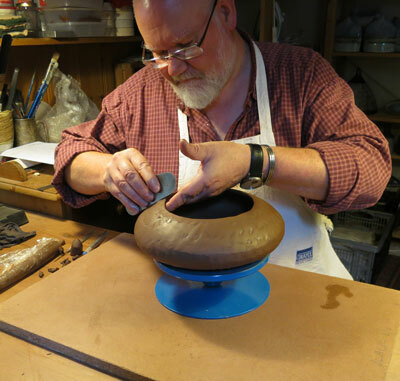 Rob Sutherland is a potter living and working in the beautiful Scottish Borders. 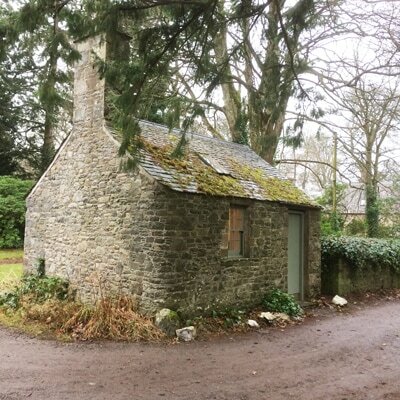 Workshop and shop located in the grounds of Traquair House. "All of my ceramics are hand-built and utilise the technique of coiling. This involves building a pot layer by layer. Each coil is melded into the coil below and is pinched, squeezed, moulded and scraped into shape. I enjoy the slow pace of this method which allows a considered response to the form as it grows". "My influences are grounded in nature, from deciduous woodland to fossil encrusted pebbles. The forms carved on the surface of the pots are influenced by the patterns of nature be it the annual growth rings of lichens, ripples in water or the raked gravel oceans and rivers of the Zen Buddhist dry gardens of Japan"
My new Etsy shop, established June 2018 is now open. Click here to visit shop. 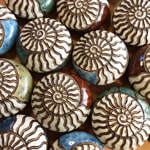 ​Currently I'm selling my Ammonite Pebbles but looking to expand the range of items for sale. Watch this space. Opened on 1st April 2017, my workshop and shop is set in the beautiful grounds of Traquair House near Innerleithen in the Scottish Borders. I'm open for visitors between April and November. Come and see an extensive display of my work. Prices to suit all pockets. Great gift ideas. Normally there is a charge to enter the grounds of Traquair House but if you tell staff at the gate you're visiting my workshop you will be allowed into the grounds for free. If you're making a special journey call or text 07563 178654 to confirm opening times.